1. (If You Smoke) How Will It Affect Your Success? One of the best things about implants is that they have a 98% success rate. However, that drops to about 85% for smokers. Since smoking interferes with the healing process (an important part of the procedure’s success) it’s important to let a dentist know beforehand and ask them about one of the many smoking cessation aids available. 2. Do You Have Enough Bone Mass In Your Jaws? After teeth have been taken out, your body begins to slowly reabsorb the surrounding jawbone. Since this causes your jaws to become smaller and thinner over time, you may not have enough bone mass left to support an implant if it’s been a long time since you lost your teeth. 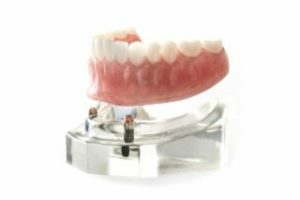 However, there are ways to get around this, including a bone graft or getting an implant-retained denture that uses smaller, shorter implants. Your dentist will take images of your teeth and jaws to help them evaluate your bone levels before making a recommendation. 3. Will You Heal Well? Certain general health conditions can interfere with your body’s ability to heal, which can lower your chances of success. 4. Do You Have Good Oral Hygiene Habits? Dental implants can’t get cavities but they still need healthy gum tissue to support them, just like natural teeth. If the gums and underlying bone aren’t kept clean and healthy, your risk of failure goes up. That’s why it’s so important to brush and floss regularly, as well as get regular checkups and cleanings. These visits are a chance to monitor the health of your implant and catch any problems early on. By discussing these 4 questions during a consultation and getting the best treatment plan for your needs, you’ll be well on your way to better oral health after tooth loss. Dr. Thomas Neslund is a general, cosmetic, and restorative dentist with nearly 30 years of experience. In that time, he’s helped hundreds of patients improve their oral health and quality of life after tooth loss. He always starts by evaluating his patients’ specific needs so he can recommend the best solution for them. If you’d like to know if dental implants in Boiling Springs are right for you, you can reach him through his website.